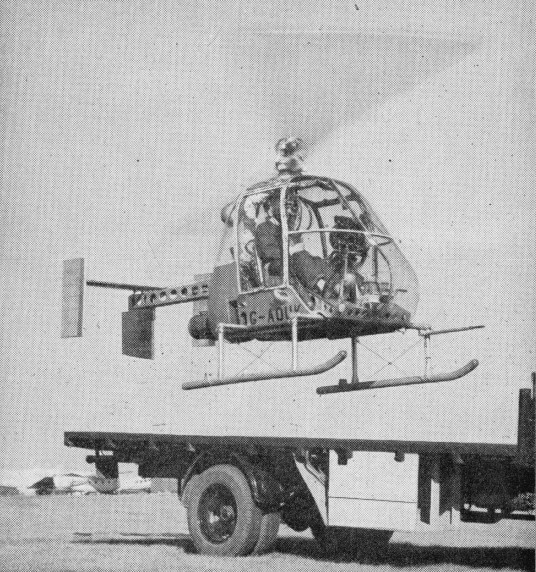 During 1953 the War Office collaborated with the Air Ministry and the Ministry of Supply in the formulation of a specification for a simple and relatively inexpensive small helicopter for use by the Army for reconnaissance and other secondary duties such as casualty evacuation and training. The requirements were severe in terms of vertical climb performance, in tropical as well as temperate conditions, though endurance and speed were less stressed. The helicopter had also to be capable of being dismantled and assembled easily and quickly and of being transported on a standard Army three-ton truck. The specification was sent to helicopter manufacturers in the British aircraft industry, with requests for tenders, and some half-dozen designs were submitted. Fairey eventually won the contract in July 1954 and a preliminary order for four prototypes, to specification H.144T, was placed. Two more were planned as a private-venture investment. 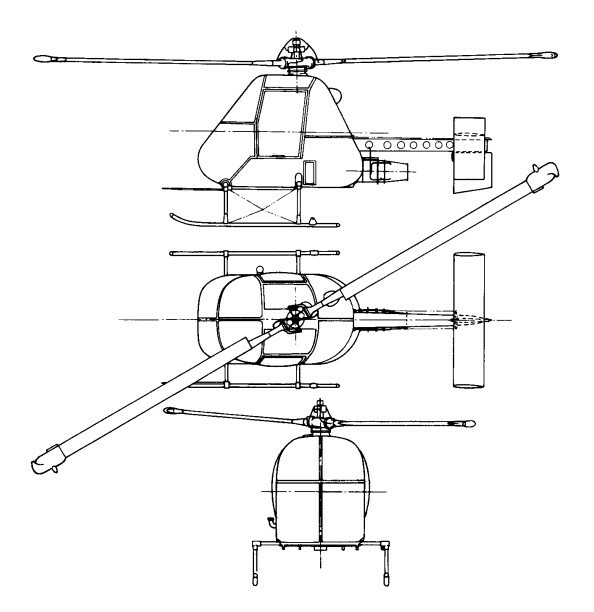 Fairey believed that a rotor-tip drive would be ideal for the Ultra-light Helicopter (as it was named), and preliminary studies showed that a tip-jet-driven version could be designed to do better than meet the requirements. A suitable small turbojet power source was already available in Britain — the French Turbomeca Palouste BnPe.2, which had been re-engineered with the turbine in Nimonic 90 alloy and was built under licence by Blackburn and General Aircraft. To provide tip-jet air pressure in addition to residual thrust an oversize centrifugal compressor was fitted, and the excess delivery was bled off from the casing surrounding the annular combustion chamber. Untainted air was thus obtained at an initial maximum pressure of about 2.8kg/sq.cm. With this available pressure it would have been possible to design the rotor for operation using simple air jets, but, with their background of experience of fuel-burning pressure-jets, these were employed. The compressed air was delivered, via a lagged duct, to the rotor head and, with metered fuel from the same tank as that supplying the gas turbine, and carried by centrifugal force to the tip-jets. There was a manually-operated blow-off valve for use when the engine was being ground-run, and, later in the test development, when rotor-power needed to be cut so that rapid autorotative descents could be made. With the ample power available the rotor was designed to operate at high revolutions and to have a small diameter (8.53m), thus meeting the need for compactness. Two of the later variants were fitted with a slightly bigger diameter rotor (9.75m) so as to improve the performance. The small diameter of the rotor permitted the mechanical design and control system to be simplified. No drag hinges were employed and the two blades formed a see-saw combination without individual flapping hinges. A direct tilting-head type of control was employed in the first prototype, but an irreversible hydraulically-powered system for the cyclic-pitch control was designed (together with a flexible pylon) and fitted to this and to later aircraft. The pilot's controls were those normal for helicopters — with a collective-pitch lever which carried a twist-grip throttle for increasing engine revolutions and consequent air pressure for the tip-jets, and a stick for control in roll and pitch, but the rudder-pedal directional control was through a steel-skinned rudder on which the jet efflux impinged. The Ultra-light was very simple in construction, the basis of which was a large light-alloy box containing the bag-type fuel tank. From the centre of this box rose the rotor pylon on which the remainder of the aircraft was, so to speak, hung. To the rear was attached a box-girder boom, under which the engine was slung, carrying the rudder — or rudders and an adjustable tailplane in later versions. This boom had a transport joint aft of the engine mounting. The crew's seats (the observer facing aft in the proposed Army version) were on the basic box structure. The undercarriage consisted of a pair of skids attached to tubes running across the underside of the box. The initial flight of the first prototype, XJ924 (F.9423), was made at White Waltham by W. R. Gellatly, on 14 August, 1955 - only about 13 months from the start of design work — and it was shown and flown at the SBAC exhibition and display at Farnborough early in the following month. Progress on the original basis was, however, to be overtaken by events. 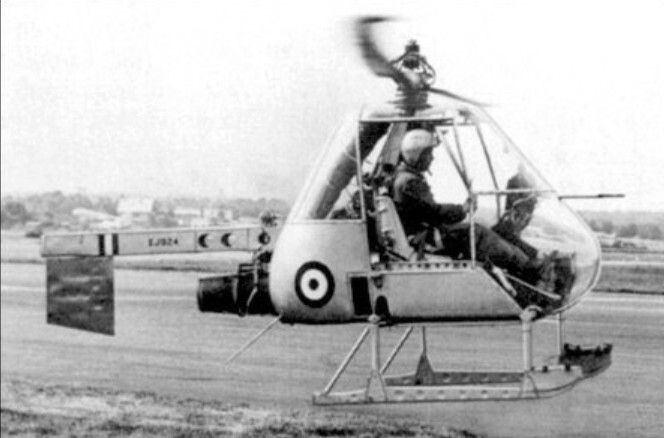 Before mid-1956 the Ministry of Supply had, for reasons of economy, ceased to support the Army project, and development of the Ultra-light was continued by Fairey on a private-venture basis, with considerable and expensive efforts to develop the original design and to sell it to prospective Service and civil operators. There have been some considerable differences, among semi-official and other records, of the actual identities of the various Ultra-lights, of the total number completed and of the sequence in which they were produced. The principal difficulty in straightening the records has been caused by the fact that the original order 'bookings' were changed. Four (F.9423—9426) were planned to meet the original Ministry of Supply contract and two more (F.9427—8) were built by Fairey on a private-venture basis. After a certain amount of work had been done there were interchanges of components and then, following the Ministry cancellation, Fairey increased their private-venture programme. Some uncertain confirmation of the sequence of the completion of the Ultra-lights can be found in the press reports of the SBAC displays of the period. One such report for 1956 said that four had by then been built, the fourth being G-AOUK; another, after the 1957 display, said that five had been built, including G-AOUJ, which was at the show with G-AOUK, and that a sixth, G-APJJ, was under construction. The serials XJ924, 928, 930 and 936 were allotted to the first four and three of the six were civil-registered following the withdrawal of official support. In order of c/ns, but not necessarily of completion or of initial flights, the six appear to have consisted of the following individual aircraft. The first prototype, XJ924 (F.9423), was the first to fly and was later modified with the hydraulic cyclic-pitch control and flexible pylon already mentioned. The second prototype, XJ928 (F.9424), became a Fairey de velopment aircraft for which a modified cabin was designed so that different loads, such as a stretcher case, could be accommodated; this was registered G-AOUJ and fitted with the hydraulic controls, flying for the first time in the revised form on 1 September, 1957. The third prototype, XJ930 (F.9425), was delivered to the Ministry of Supply. The fourth, XJ936 (F.9426), flown on 24 August, 1956, was the first to be fitted with the hydraulic controls and the flexible pylon; it appeared at die SBAC Display in September 1956 registered G-AOUK, and was the company's principal demonstration and trials aircraft. Operating from the back of a standard truck, it demonstrated a rate of climb of 6.75m/s and a rate of descent in autorotation of 20m/s. The first of the two original private-venture aircraft, F.9427, was apparently used only for resonance tests and for ground-transport trials. 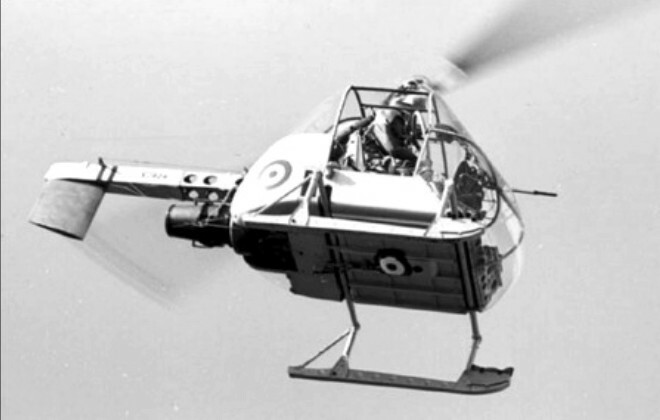 In the autumn of 1957 G-AOUJ underwent trials aboard the frigate HMS Grenville to determine the practicability or otherwise of operating small reconnaissance helicopters from platforms at sea. More than 70 landings and take-offs were made in winds of up to 62 knots, with the deck sometimes pitching through 3.05-3.66m and rolling up to 14 degrees each way. During 1958 both G-AOUJ and G-APJJ were being evaluated by the Royal Navy. The second, F.9428, was registered G-APJJ and flown initially in 1958; this had a cabin similar to that of G-AOUJ and was used for trials by the Royal Navy, operating from the deck of a destroyer, HMS Undaunted, before going to the Royal Aircraft Establishment, Bedford, and later to the College of Aeronautics at Cranfield. In 1957 the Piasecki Aircraft Corporation of Philadelphia, USA, had obtained an option to build and the US Army was evaluating it for uses similar to those originally envisaged by the British authorities. Nothing, however, was to follow from these developments. 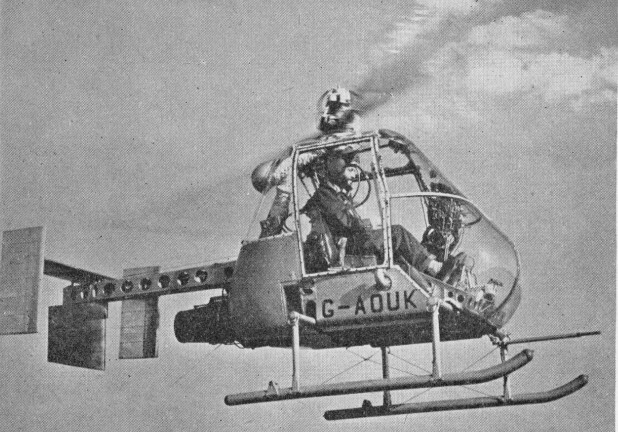 Typical of the continuous effort being put into Ultra-light demonstrations was the use, early in October 1958, of the stretcher-carrying G-AOUJ, flown by Peter Twiss, in a nuclear-war casualty exercise by the RAMC near Aldershot; the Rotodyne also took part in this exercise. Interest in the Ultra-light had been shown in Canada, and G-AOUJ, with its bulged nose to take a stretcher, and with special navigation and heating/ventilating equipment, was shipped out there later in 1958 for cold-weather trials and demonstrations by Lt-Cdr J. G. P. Morton. In the spring of that year a new draft specification was being drawn up for a version suitable for operation from small ships on anti-submarine duties both in attack (with a homing weapon) and communication roles. This proposal was based on a draft naval staff requirement and was a variation of the aircraft described in a brochure of April 1957 in which a naval strike version had been offered. The three civil-registered Ultra-lights were necessarily designed to meet airworthiness requirements and G-AOUJ and G-APJJ were duly certificated in the autumn of 1958. Work on the project was finally abandoned in 1959. G-AOUJ has returned to the Helicopter Museum and restoration continued at Weston super Mare, but various parts, and drawings, are missing. A particular problem now is the swash-plate mechanism, of which there are no details.